The first game this Saturday will be between the Texans and Chiefs which will probably be one of the most interesting matchups because of the late starts that both teams had. The Chiefs who began the season going 1-5 then winning the next 10 games and the Texans who began the season going 1-4 then won their division with a respectable 9-7 record have gone from two of the weakest teams to two of the NFL’s strongest teams. To begin, Alex Smith has had an amazing year at QB reaching a career record of 3,486 passing yards which resulted in 20 touchdowns. Through the last 10 games with the help of very skilled players such as Jeremy Maclin who broke 1000 yards and Travis Kelce who had 72 receptions for 875 yards, Alex Smith has made the Chiefs seem nearly unstoppable. Although Smith seemed weaker the last two weeks throwing three interceptions, he still performed well enough to win both games. In contrast to the Chiefs’ offense, the Texans’ offense seems to be hindered through the loss of Arian Foster and their quarterback situation in which they have had four different QBs throughout the season. However, the Texans don’t seem to be letting that stop them since their 30-6 win over the Jaguars last week. If the Texans’ offense is going to succeed this Saturday, Hoyer will need to utilize DeAndre Hopkins who ran for 1,521 yards this season. As for the defensive side of the ball, both teams have had an extremely successful year with the Texans being ranked the 3rd best overall defense in the league and the Chiefs who were ranked 7th overall. Since the Chiefs already have a solid offense ready to go this weekend and a defense that punishes opposing teams earning the 4th most turnovers in the NFL, the Texans’ defense will need to step up if they hope to continue into the Divisional Round of the Playoffs. JJ Watt, the NFL’s leader in sacks, could help lead the Texans’ defense in trying to halt the Chiefs offense through putting pressure on Smith and stopping the run. Unfortunately for the Texans though, the Chiefs have a very strong defensive line themselves who together earned 47 sacks this season and they will face a Texans’ offensive line that managed to give up a total of 36 sacks this season. Since the Chiefs seem to have a more stable offense and a defense that will be able to compete with the Texans’ strong defense, they will most likely pull off a win on a road in a tough matchup. The Bengals will now be entering their fifth consecutive first round playoff game on Saturday. In their previous four games which all ended in losses, the Bengals were able to be within a score of the opposing team by the end of the first half. However, the Bengals have managed to lose each game and three of those losses were only within a field goal. Since Andy Dalton will not be playing on Saturday, the Bengals’ defense must step up if they are to win and make key plays. 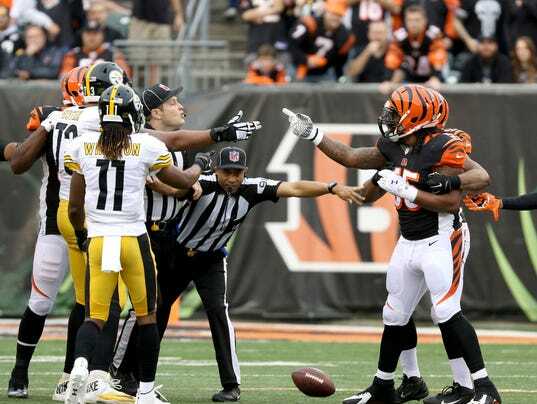 In the first game between the Bengals and Steelers, the Bengals were able to obtain three interceptions. However, in the Bengals loss to the Steelers in week 14 the Bengals defense only got one interception. While the Bengals’ defense is perfectly capable of making key defensive plays, eventually the offense will also have to step up and that could be the entire game on Saturday. AJ McCarron has only had four games as an NFL starter and may not have the experience to win a major playoff game. He has already shown that he is capable of completing basic plays, he seems to lose accuracy with mid to long range passes which could end up being the Bengal’s biggest issue in a close game. The truth is, while the Bengals have been the better team this entire season, the Steelers have the better QB. Roethlisberger as an elite QB has the playoff experience to perform well and he has good players such as Antonio Brown and Martavis Bryant to help him out. The Bengals still have hope to win since they won’t have to deal with DeAngelo Williams and strong defensive players such as Adam Jones should be able to give McCarron a few short distances to the end zone, however my prediction is that is most likely won’t be enough to ultimately win the game resulting in a Steelers’ victory. Posted in Cincinnati Bengals, Houston Texans, Kansas City Chiefs, NFL, Pittsburgh Steelers.